Cleaned up the bed tonight – removed a lot of broken bolts and leftover fasteners which held down the wood. Removed the toolbox and the spare tire carrier. And oh! I put the original horn in! Its not finished, but I had to hear it under the hood! I took in the truck so I could pick the teach’s brain on some of the repairs. And although I didn’t get the rear fender completely finished, it was a good course, and I learned a ton. Classmates were awesome too! 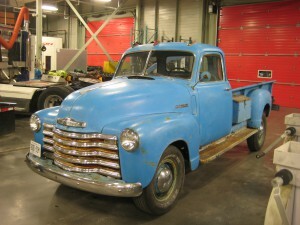 As tonight is the last night of school (body work) – I had planned to take the truck in for the class to see. I had to get the plates back on, with valid stickers. I missed the chance last night to do that, I was late getting to MTO. At 9am this morning, I made my way to the MTO, got my plates, and was off back home to slap em on the truck! Only thing left to do now was get some gas and get to work! Oh ya- I had planned to take the truck to work as well. Just added 1949chevy.com to my Stovebolt.com profile, and linked it to my facebook. Hope you enjoy my progress shots as much as I enjoy working on the truck! Dumper is out of storage! Got the tarp off – threw the battery in – took it out of the backyard! Fixed a muffler already with it – can’t wait to pick up gas and put it to work on the ’49 body panels! Put some fiberglass on the fender tonight – it was messy and I loved it. Airport door guys can suckit.